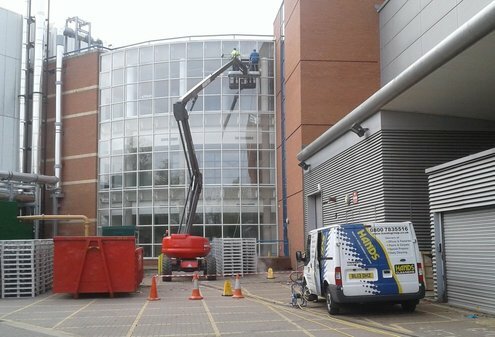 Here at Hands Group, we offer different types of commercial window cleaning Derby and Derbyshire. We provide window cleaners for domestic, commercial and other industries. If you are looking for a consistent cleaning company, then contact us here at Hands Cleaners. We provide excellent and affordable window cleaning across the east midlands. In Derbyshire, there are a lot of high standing buildings, and at Hands Cleaners, we can clean windows up high and hard to reach areas with different methods. Cleaning a window by hand is a simple and cost-effective way of cleaning windows. All we need near enough is a ladder, bucket and sponge. This type of window cleaning is best suited to domestic properties and small businesses. With this method, we can get up close to the window spotting any marks and missed parts. As the leading commercial window cleaners Derby, no job is too big for us. High-level window cleaning can be challenging, but with our method of abseiling makes it much easier to get into the hard to reach areas of a high building. All safety precautions are taken when carrying out our entire window cleaning methods, especially abseiling. It can be quickly set up and offers quick cleaning for a whole building, and just like the traditional window cleaning, we will be able to get close to the window to notice any missed parts. We also offer high-level platform window cleaning which allows our window cleaners to freely move on a platform that is placed on the side of any building. The high-level platform can move up and down to reach the higher and lower levels of the building. To finish the job off we also offer inside window cleaning whether that is the opposite side of the window or any internal glass windows. We ensure windows are cleaned and finished without streak marks or missed areas. Here at Hands Cleaners, we use specialist window cleaning techniques and all of our staff are fully trained and experienced ensuring that windows are left spotless, with no watermarks. Satisfaction is our top priority, and we provide the highest level of quality for all of our customers. Not only do we offer commercial window cleaning Derby, but we also cover Leicester and Nottingham. We also offer a variety of other cleaning services such as builder cleaners. Bespoke window cleaning solutions – Different clients have different requirements and sometimes when it comes to windows, the simplest approach is usually the best. Having been in the cleaning business for many years, we understand that the circumstances can be different. That is why we offer a variety of cleaning methods. We can clean by hand for the easily reachable windows and we can also use high-level window abseil for the larger commercial buildings. We also use reach and wash systems and a high-level platform. No matter what the window cleaning job is, it is never too big for us. Experience – we have been in the cleaning business for over 40 years. We have an in-depth understanding of different types of windows and the care that should be taken when cleaning each. With our experience, you are guaranteed great results every time we clean your windows. Comprehensive window cleaning – We offer inside and outside window cleaning services based on what our clients are looking for. With our service, we make sure there are no streak marks or watermarks left on the window and we guarantee spotless windows with no missed spots and a high level of service delivery to all our clients. For commercial window cleaning in Derby, contact us today to get a free quote on 01509 501 110.